The song “TSOP (The Sound of Philadelphia)” was a product of Philadelphia International Records. 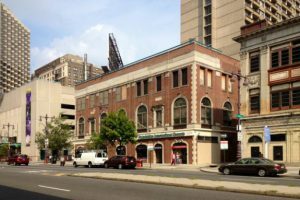 The label was founded by Kenny Gamble and Leon Huff in 1971 and based out of the former Cameo-Parkway Records building on South Broad Street, where Gamble and Huff formerly were session musicians. The label produced hits for The Jacksons, Patti LaBelle, The O’Jays, Teddy Pendergrass, and Harold Melvin & the Blue Notes, among others. “TSOP” was one of Philadelphia International's earliest hits. It was recorded by studio band MFSB, which provided backing tracks for the O’Jays’ number-one hit “Love Train” the year before, and The Three Degrees, who scored a platinum record on their own with “When Will I See You Again?” the same year. The mostly instrumental track was used as the theme song for the television show Soul Train from 1973 until 1975, after which covers of the song were used at various times until the show stopped production. 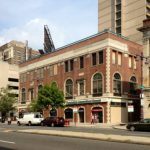 Philadelphia International Records remained at the South Broad Street office until 2010, when the building was damaged by fire. It was demolished in 2015. “TSOP (The Sound of Philadelphia)" was written by Philadelphia International Records’ Kenny Gamble and Leon Huff. Gamble (at right in this photograph) was born in Philadelphia and Huff (center) in Camden, New Jersey. The duo met in the 1960s when they were both aspiring players in the Philadelphia music scene. 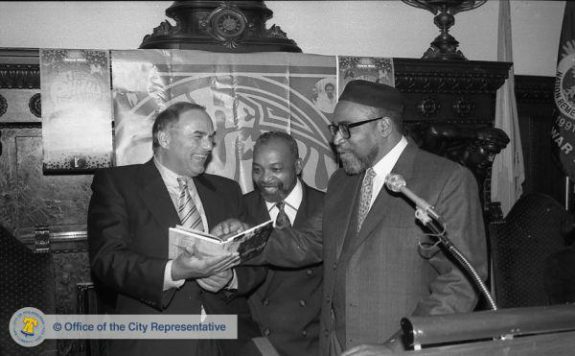 They founded Philadelphia International Records in 1971 after writing songs for artists on other labels, like Detroit’s celebrated Motown Records. By 1997, they’d written over three thousand songs and produced over 170 gold and platinum records. 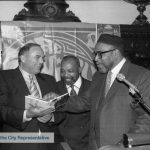 They are shown here with Mayor Ed Rendell, when he declared the week of September 30, 1997, to be “Philadelphia Sound Week” to honor their contributions to the city’s musical legacy. Gamble and Huff originally wrote “TSOP” as the theme song for the African American TV dance show Soul Train, which debuted as a local program in Chicago in 1970 and was syndicated nationally the following year. As Soul Train grew increasingly popular in the early 1970s, its creator and host Don Cornelius (1936—2002) sought a new theme song for the program. In 1973 he came to Philadelphia to work with Gamble and Huff. With input from Cornelius, Gamble and Huff developed the song’s basic melody and rhythm. MFSB members helped shape it with their ideas and Bobby Martin (1930—2013), one of Philadelphia International’s top arrangers, added string and horn parts. Recorded in 1973 and released as a single in early 1974, “TSOP” rose to number one on the Billboard Top 100 chart that spring, the first television theme song ever to reach that mark. The song also topped the R&B and Adult Contemporary charts. Gamble and Huff intended to call the song “Soul Train” after the TV show for which it was written, but Cornelius would not allow use of his program’s name on the record so they entitled it “TSOP (The Sound of Philadelphia)” instead. Cornelius later came to regret his decision, calling it one of the biggest mistakes of his career. “TSOP” served as the Soul Train theme until 1975, when the show adopted a new song. Soul Train had a number of different theme songs over the years, including several remakes of the original “TSOP,” before going off the air in 2006. Its brief vocal parts notwithstanding, “TSOP” is essentially an instrumental piece. It has many of the defining characteristics of the Philadelphia International sound: a lively, danceable beat with a pulsating rhythm, a highly polished arrangement with lush strings and crisp, punctuating horns, all wrapped in a sophisticated multilayered production. Philadelphia International ruled the pop and R&B charts with this formula through most of the 1970s. Indeed, the phrase “TSOP” came to refer to the unique Philadelphia International sound as much as the specific recording. While songwriting credits at Philadelphia International often went to Gamble and Huff or other staff writers at the label, the MFSB team actively participated in developing the songs and creating their signature instrumental parts. Like the Funk Brothers in Detroit and Booker T. & the M.G.’s in Memphis, the house bands for Motown and Stax Records, respectively, MFSB played a major part in shaping a highly successful style of American soul music. With the song “TSOP,” they had the opportunity to step out from their usual accompanying role into the limelight as featured artists. In so doing, they created a number one hit record and helped to define the Philadelphia International sound. Guralnick, Peter. Sweet Soul Music: Rhythm and Blues and the Southern Dream of Freedom. New York: Harper & Row, 1986. Hirshey, Gerri. Nowhere to Run: The Story of Soul Music. New York: Da Capo Press, 1984. 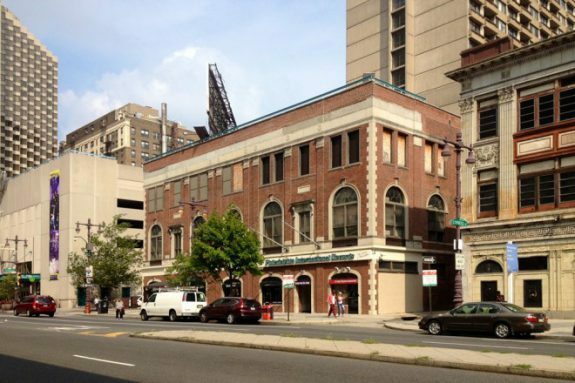 Site of Philadelphia International Records headquarters and, earlier, Cameo-Parkway Records (building demolished in 2015; condo high-rise under construction at site in 2016), 309 S. Broad Street, Philadelphia. Site and historical marker for Sigma Sound Studios, 212 N. Twelfth Street, Philadelphia. Thanks for this, Jack! Even before I saw the by-line, I knew it had to be by you. There’s such a wealth of music history and tradition in Philadelphia; I’m glad there are people like you curating it.